So often with Amouage, I feel like Opposite Woman. Most perfume critics laud Fate Woman as a masterpiece, but I found it a cloying powder bomb. Tons of perfumistas cherish Memoir Woman, but it’s a train wreck on my skin. Now, Journey Woman. I’ve read reviews hinting it’s simple, thin, and cheaply made. Naturally, I adore it. Some reviews have called Journey a simple fruity floral, really no more than a niche-produced department-store-style fragrance without much interesting going on. Not in my world. I admit that when I first spritzed from the sample vial, the fragrance’s sweet fruitiness repulsed me. Worse, I had a hunch it would stick to my sweater until I tossed it in the wash (this part turned out to be true). However, I’ve found that sometimes the first spray from an atomizer that’s been on the shelf a while doesn’t represent the fragrance well, and that might be what happened with Journey. When I gave Journey a second try — then a third, then fourth — sure, I smelled stone fruit, but I also got a kick of honey and dry orange blossom, giving the feeling of cold fruit wrapped in soapy suede. Then, the tintinnabulation1 of jasmine grew — lots and lots of lovely jasmine — and the orange blossom’s soapy suede morphed to osmanthus. Among the fruit and muffled flowers I smelled a touch of brown spice. An animalic hint, just a kitten’s purr worth, grounded the perfume. Over time, the fragrance continued to change, becoming creamier and woodier, and, finally, settling into a quiet woody-musky aura. To me, Journey is plenty complex and full of texture. The honey and stone fruit stick around a while, but where I usually find that sort of thing off-putting, here it fascinates me, like the jewel-toned cherries and queer green and yellow bits in fruitcake. So far, Journey intrigues me more the more I wear it. Now for the most mystifying (to me) accusation, that Journey smells like it was made on a tight budget. I don’t get it. I’m not an expert, but there’s something in a fragrance’s depth and texture that tell of the quality of its materials. Let me draw a comparison: I spend way too much time in thrift stores, and I used to work in a vintage clothing store, so I’ve felt a lot of wool in my time. I can run my hand blind over a rack of coats at Goodwill and feel the difference between pre- and post-1980s wool. It’s that way with perfume, and Journey smells like Scottish cashmere feels. All that said, you might not like Journey, and I definitely recommend sampling before you buy. Maybe Journey is particular and best suits a narrow audience. Or maybe Opposite Woman is more fascinated by fruity floral orientals than she'd thought. I'm okay with that. I’m saving the rest of my sample for a rainy weekend afternoon. When the sample runs out, a bottle might need to replace it. Amouage Journey Woman Eau de Parfum’s list price is $315 for 50 ml and $380 for a 100 ml bottle. Savvy online shoppers can find it for less. 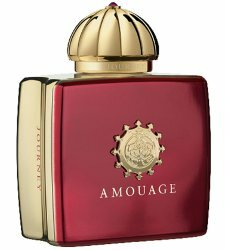 For information on where to buy it, see Amouage under Perfume Houses. 1. With apologies to Edgar Allen Poe's "The Bells." I love getting reviews from the perspective of the ‘opposite’ – there’s nothing better than an alternative point of view to open discussion on a topic so thank you! I was wandering around an apricot orchard last week (laden trees, with damaged fruit rotting on ground…apricot, honey, fermented fruit scents ) wondering about a perfume match and this might be the one. Hopefully I will sample it one day. I definitely smelled Journey’s honey, but the apricot could have been a “plucot” to me instead of apricot. Why weren’t the apricots harvested in the orchard you visited? I’m so sad to imagine all that gorgeous fruit uneaten! Just the very damaged fruit…usually from birds and wasps. Not too much wastage. I like Journey too! I didn’t think it smelled cheap or generic at all. I have more misses than hits with Amouage – mostly, I think, b/c of the big incense, woods and oud accords in their early hits. That being said, my fav Amouage of all is Memoir Woman which on paper shouldn’t work for me anyway. The only other Amouage that I like are Dia and Gold for Men, which I find to be a masterpiece, but I don’t actually enjoy wearing it b/c it just never goes away. Like 22 hours of sumptuousness is just not for me! I have a small decant of Amouage Honour, which got the cold shoulder in general, but sometimes I reach for it when I want a big wet cheerful tuberose. I’ve not smelled Fate or Journey, so I can’t comment on your reviews above, but when you like it, you like it, right? I would love very much to go to a shop where I could smell all the Amouage at one time to really get a sense for their entire line. Smelling the entire line at once could be overwhelming! (In the best way, of course.) I didn’t think much of Journey when I sniffed the tester strip, and I’m glad I had the chance to sample it on skin (thank you, Perfume House). Oh, Perfume House! Actually, the first time I tested Gold Man was at the Perfume House the last time I was in PDX (May 2010). Do you hear the sobbing? Another visit is long overdue! I gingerly approached the Amouage display b/c I was really concerned about wearing out my nose. Gold Man just really jumped out as my fav and stayed with me for a long time. In this case, a fragrance that never goes away is useful on a strip of paper that has to travel back across company! er, across country that is…. Thank you Angela, another interesting review/perspective into Amouge. Not much from the house matches me for similar reasons, so this is going on the sample purchase list! Let me know what you think, and be sure to try it more than once (if the honey doesn’t kill it for you at first). Lol! I like honey, but now you have me curious about how Much honey I like! If you like it, you’ll be just fine. I love Fate. Power agrees with my skin…I want to try Memoir, and now this Journey…. Sampling Amouages can be dangerous…. I like Journey too, and I definitely get a lot of suede/osmanthus in it. There is a note in the base—I have no idea what it is, but I can identify it in other (very different) perfumes like Naomi Goodsir’s Or du Serail, Atelier’s Silver Iris, a couple from Olfactive Studio—that sometimes stands out just overwhelms everything else. It reminds me of a sort of scratchy, graphite-colored roughness, if that makes any sense. Fortunately it’s not as noticeable to me in Journey, but I’d love to figure out what it is… I’m guessing there’s some fairly common aromachemical or molecule that I’m particularly sensitive to? Anyone else experience something similar? Interesting! I’d love to know what this is, too. Yes, I know exactly what you mean about that base note! I always attributed it to a woody aromachemical because it’s scratchy. Then I just read a comment here today about cashmeran under PG’s Bouquet Massai. Fragrantica refers to cashmeran as having a wet cement note, so maybe that’s at least part of what we’re sensitive to. Interesting review Angela. I really enjoy Lyric but my favorite so far is Beloved. I have sampled Opus III, so pretty but I have read mixed reviews about it and I find it similar to Beloved which I own. The few times I tried Honour I found it to be a bit bland. I didn’t even realize that it was a tuberose scent until I read AnnS comment. Maybe my sample was old? I dislike Fate because my skin amps cumin and Jubilation 25 is nice but I have no desire to own it. I’ve been wanting to try Memoir for a while now and now I think I’ll add Journey to my sample list. Thanks for your review! My favorite is Beloved, too. I can’t decide if hearing you say Opus iii is similar makes me *need* or *not need* to sample it. I certainly don’t need another Amouage on my FB list, but I love Beloved enough to want more of it wherever I can find it. It sounds like you can’t lose by sampling Opus III. If you like it better than Beloved, you’ll know that. If you like it less, you’ll feel justified in your purchase of Beloved. Is beauty spin reliable? I haven’t heard of them before. I just ordered Lyric shower gel from Beauty Spin and it was on my door step within two days. I would say they are pretty reliable. NJ to RI, so pretty close. BTW, if you’re interested in the shower gel, the prices vary but Lyric was only $35 ish…. on Beauty Spin which is why I ordered from them. Did you get the well-priced bottle through the discounters? I’ve considered it many times, but always feared the worst. I did. I believe I got it at beauty encounter – ?? – or maybe fragrancenet. They’re both reliable, although they’ll plague you with emails. How could I forget about Beloved!? I like it very much and it’s been hovering on my to buy list for a few years now, DUH!! So gorgeous! I’m wearing it right now! I bought a dabber sample of Beloved and tried it only once before ordering it from Fragrance net. I was so sure of this scent. IMO, it smells even better from the full bottle than the sample. This was so out of character for me. Opus Iii is very pretty too though and I would happily own them both if money were no object. ???? Sometimes (perfume) love hits like a lightning bolt! Journey was the first FB I bought from Amouage and I love it. I never thought I’d be into such a sweet fragrance, but it completely captivates me. I don’t own any other fruity florals and in general stay far away from them. I get a lot of osmanthus and honey and there are days when Journey can get much more animalic on me than I expected, but I like that it surprises me in that way. The dry down is gorgeous. This was a really interesting read. What did Memoir smell like on you? I’m curious because that one was a close contender for FB on my list. I also like Fate, but perhaps it’s not as much of a powder bomb on me as it is on you. You know, it wasn’t Memoir’s profile that went wrong on me, it was how the perfume developed. Somehow, as it evolved, the gears ground, and the transitions were messy and unappealing. On me, at least. Oh, I love Journey! Thank you for this review. I love knowing I’m not the only Opposite Woman (????) in regards to Journey. I too have heard others suggest that it’s blah or not up the quality you expect from Amouage, but I disagree. I think Journey fits perfectly into the family. I wear it when I’m in the mood for Amouage but not the drama of Lyric or the sexiness of Beloved (which my husband goes bananas for). I find it elegant and wearable uplifting. Uplifted is a wonderful way to feel wearing a fragrance! I own FB of Fate and Memoir (and Epic) but wear them infrequently-I have to be in the right mood and no hint of a migraine. I think you’re right–in the comments, plenty of Journey lovers are showing up! Oh yeah, wait! … make that three measly tries. Amouage Sunshine was the third try. Scrubber. Regardless of the hazards, I will bravely persevere! I haven’t tried Opus VIII, but couldn’t agree with you more about Sunshine. I even gave away my sample. I am not a fan of that bottle either. I’m sure there was more to it but I remember fruity tobacco. Blach, like an ashtray that needs to be emptied. Apologies to those who like it. It was a strong no for me. It doesn’t sound very entrancing. Oh yes, I gave my sample away immediately. Have you ever tried Jubilation 25? That’s one of my favorites. Thanks for the suggestion, Angela. There’s gotta be something from the line that works for me, right? Otherwise I might have to hand over my perfumista badge! Oh, no! You’re allowed to reject whole lines if you want! Just as long as you sample first. Sunshine I cannot do either. I gave my sample more tries than I would many others because I wanted to just even..like it. Something awfully synthetic, cloying and sharp (very similar to melting plastic, the type with dark, black fumes) just makes me want to scrub it off, fast. I wanted to like it too, and I figured it didn’t sound like I’d end up smelling like a stoner circa 1970 the way the first two worked out. I was right about that part, but it wasn’t an improvement. I want to see a movie featuring your reject perfumes turned into characters! This isn’t sounding like a winner! Angela, my FB Journey and I are soon happy to see another Opposite Woman! I find Journey to be a very beautiful osmanthus / tea fragrance; both elements which I adore. Sitting next to the osmanthus trees in my garden when the blossoms are in full bloom is something I enjoy very much in doing. So it is no surprise how I fell (hard) for Journey when I found it to have just the perfect amount of nectar, sweetness and light touch of smokiness to conjure up the authenticity of these notes instead of some form of “rendition” or “inspiration”. Can I also take a very short moment to say how gorgeous that berry red and gold bottle is? Loving it. I’m glad you love it! And I’m so envious of your osmanthus tree. I didn’t even know they grew tree sized. Fabulous. I’m another lover of Journey, i bought a small decant last autumn, and found it perfect for that transitional time of year. I received a bottle of Epic for christmas, and frustratingly discovered i don’t love it as much as jubilation 25 or journey. However layered with a rose perfume, Epic is really beautiful. I’m saving the rest of my journey decant for early spring, it will be so gorgeous with blue sky’s, birds singing, sunshine and green buds and shoots! What a fabulous Christmas present, but then what a let down not to love Epic! I’m glad you found out that it wears well with rose. I’m definitely an Amouage fan, but only for a select few — but for those, I’m passionate! Epic Woman is my all-time favorite and I’m working my way through my second bottle. My other favorite is Opus V, but it is so potent, I would never get through a bottle in a lifetime. I order about one sample per year and wear it occasionally as a sleep perfume. It has something that really helps me sleep and have good dreams. Osmanthus: this will be year three or four and, to date, no blossoms on the shrub! I keep hoping that with global warming, it will want to bloom. It has managed to survive the increasingly milder Dutch winters. I’m insanely jealous of Happy Cat! Where do you live, Happy? I don’t know much about Cypriol, except that Luca Turin wrote that it’s part of the reason for Timbuktu’s radiance. It sounds like Amouage fragrances suit you well! Watch out pocketbook! Thanks for the review! The first time I tried Journey on skin I got a really golden osmanthus and honey that smelled subtle but really nice and I had to go try it again. My second time trying it that same opening felt screechy and harsh to me which baffled me. The fun part was the opening disappeared and later the jasmine crescendoed and lasted for hours. Don’t think I’m moved to try it again though. I have my Amouage favorites: Jub 25, Lyric W, Beloved. I would have pegged Honour as the pale fruity floral(although I have it as a shower gel and like it that way). Perfume can be so mysterious. One day you think you know a perfume, and the next day it feels altogether different! Amouage is very hit-or-miss with me, too. I like Dia W, I like Gold W, I like Jub XXV (Man), I really enjoy Lyric W, and although the written description of Memoir W is very Not Me, I love it. But Epic W smells like wet wood ash, very acrid, and Jub 25 goes as wrong on me as every other fruity chypre does, all sour and nauseating. Honour W was terrific until that “old vasewater/algae-filled pond” stuff showed up, ugh. Interlude W was just horribly muddled, and although I thought I’d love Beloved’s florals, it’s a powdery mess on me, very balsamic. I thought Sunshine would be good and blind-bought a 5ml split, but there’s something flat and dull and weirdly chemical about it. Haven’t tried Fate or any of the Opuses (Opera?). Honestly, I’ve stopped getting Amouage samples because I have no idea how they’re going to turn out on me. Oh, Ubar, forgot that one. I like it. Lemony floral skank. Jasmine lemonade! That’s how I think of it. It sounds like wearing Amouage really is a gamble with you! Money saved, I guess. I would have thought Honour would have been a winner, but that dry down doesn’t seem to have agreed with your skin very well.